Quattro Seals are designed to have four sealing surfaces as opposed to only two for O-Rings. This doubling of the sealing surfaces reduces the amount of squeeze required for a positive seal. As squeeze is reduced, friction is lowered and seal life is increased. 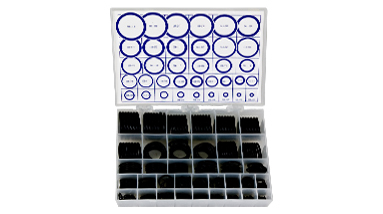 Our Quattro Seal Kit contains 226 four-lobed seals in 36 popular sizes along with a contents identification card. Quattro Seals are molded from a premium quality 70 durometer Nitrile (Buna-N) compound. Quattro Seal sizes correspond to AS568 O-Ring sizes.